Contested in the hills above Monaco, the final day of the Rallye Monte-Carlo saw Stéphane Lefebvre showcase his skills. 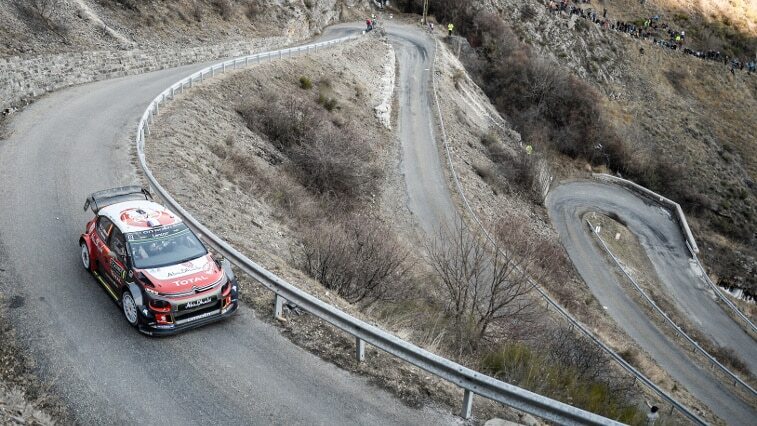 The young Frenchmen produced an impressive display on the Col de Turini to claim C3 WRC's first stage win. Citroën Total Abu Dhabi, Craig Breen – who finished fifth overall – and Stéphane Lefebvre therefore put their first points on the board in the 2017 World Championships. The schedule of the final leg served up the mouth-watering prospect of two runs over the Col de Turini, with repeat passes on the Lucéram – Col St Roch and La Bollène Vésubie – Peira Cava stages. When it came to choosing their tyres for the loop, the drivers were uncertain what to do due to the weather forecast, which suggested there would be snowfall towards the end of the morning. In the Citroën Racing Team, Stéphane Lefebvre opted to go with four Michelin Pilot Sport S5s (soft tyres), and two Pilot Alpin Q4L/R1 winter tyres (no studs) as spares. Craig Breen opted for a mix of two Pilot Sport S5s and two SS5s (super-soft tyres), and two Pilot Alpin winter tyres (no studs) as spares. On SS15, Stéphane Lefebvre and Gabin Moreau's tyre choice paid off. The French crew produced a superb performance as they tackled the Col de Turini, which saw them record the C3 WRC's very first stage win. After SS16 was cancelled on safety grounds, Stéphane demonstrated his acrobatic skills on the second pass. As the snow settled, he kept his wits about him to ensure his C3 WRC stayed on the road despite running on slick tyres. He then set the second fastest time on the Power Stage and climbed two places in the overall standings to finish ninth. Fourth at the start of Sunday’s leg, Craig Breen and Scott Martin were unable to compete with Dani Sordo's 2017 model in their previous generation car. The Spaniard moved ahead of them, but finishing in the top-five was nonetheless one of the performances of the rally. In the Drivers' World Championship, Craig Breen and Stéphane Lefebvre are positioned fifth and seventh respectively. The points scored by Stéphane Lefebvre mean that Citroën Total Abu Dhabi WRT end the opening weekend fourth in the Manufacturers' standings. Kris Meeke and Paul Nagle were not able to contest the final leg. The no. 7 C3 WRC was hit by another vehicle on the road section to Monaco, leaving the car with a damaged rear right-hand wheel and the crew were left with no option but to retire. The WRC returns in a few weeks' time at Rally Sweden, on 9-12 February. Yves Matton, Citroën Racing Team Principal:"We were expecting a better result from this rally, especially after testing, which seemed to go well. After a weekend that didn't go according to plan, the main things we can be pleased about are the consistent performance and pace of Craig, and the times set by Stéphane on the final day. That shows that the C3 WRC has genuine potential. It wasn't our rally, but we still feel positive about the upcoming rallies, starting in Sweden." Stéphane Lefebvre: "The rally finished a lot better than it started! It was a morale-boosting finish to the rally with two good times, including a stage win on the Col de Turini. We made the right call on tyre choice and I felt confident in conditions that I know well. At the same time, I didn't want to take any risks because it was important to make sure we scored points for the team." Craig Breen: "The conditions were unbelievably difficult. I guess that's why the Col de Turini has become such an iconic test. I did wonder whether or not to go with the snow tyres for the final test, but I kept the slicks and it became more and more difficult the further we went on the stage. But we managed to make it to the end and stay in the top five, which is a great result."